If you are worried about your waistline then eating sweet potato pies through the holiday season might not be a good idea, but the cooking water could reduce your waistline. 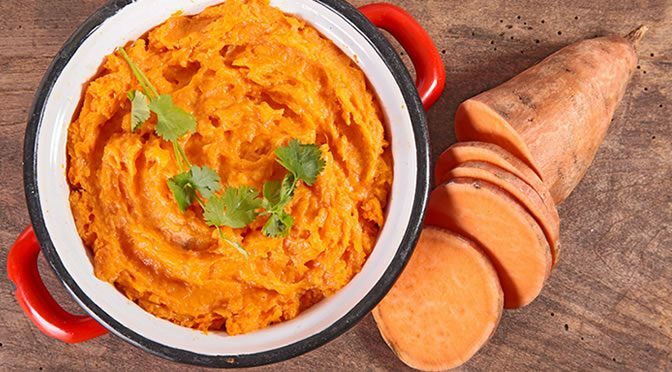 Sweet potatoes are a good source of dietary fibre and nutrients such as manganese, vitamin A, vitamin B5, vitamin B6 and vitamin C.
But on top of that, now scientists claim that the starchy water left from boiling sweet potatoes has a slimming effect. They found that proteins in sweet potatoe wastewater was responsible for suppressing appetite and reducing fat in mice but they believe that the same effects can also be reproduced in humans. 15% of sweet potato is used for producing distilled spirits, starch matters and processed foods, but a large amount of it is wastewater which is discarded and can result in serious environmental problems. Therefore Dr Koji Ishiguro and colleagues wanted to find a way to use this and consequently they examined the digestion effect of the wastewater proteins on mice. “We throw out huge volumes of wastewater that contains sweet potato proteins — we hypothesized that these could affect body weight, fat tissue and other factors. The mice were on a high fat diet and divided into two groups; one was also given high levels of sweet potato peptide protein (SPP) produced from the wastewater during the boiling process but the other group were given a low concentration of SPP. After 28 days, mice that were on a high concentration of SPP had lost weight suggesting the peptide plays a key role in controlling appetite and the breakdown of fats for energy. Overall, the mice fed high levels of SPP showed significantly lower body weight and liver mass, higher hormones regulating hunger and lipid metabolism, decreased cholesterol and triglycerides. These findings suggest that SPP can curb hunger and control the metabolism of lipids (a process that involves humans store fat breaks down for energy). “We were surprised that SPP reduced the levels of fat molecules in the mice and that it appears to be involved controlling appetite suppression molecules. These results are very promising, providing new options for using this wastewater instead of discarding it. The study was published in the journal Heliyon (Ishiguro et al., 2016).